Ruthiebear (Titusville, NJ, United States) on 1 October 2015 in People & Portrait. 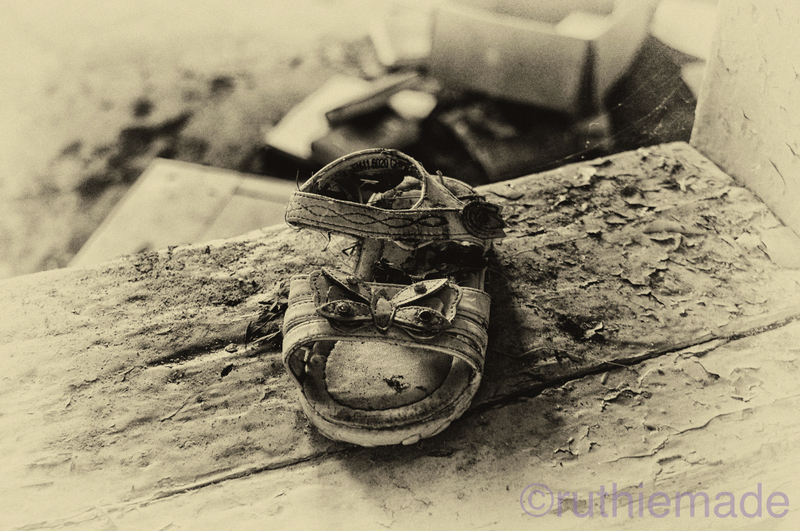 A child's sandal abandoned and seen in the kitchen area of the old giraffe house. I wonder what stories it could tell? It's really strange. I also would like to know the story behind. Comme un oulbi ... jolie prise ! Great atmosphere and superb tones . 'If the shoe fits . . ' . . strong image. Nice butterfly on the sandal, the tones heighten the abandonment so very well ! The cobwebs and peeling paint add to the atmospheric quality ! Well seen and excellent presentation. Yes, every little detail will have its own story. Voilà un oubli très photogénique ! Oh trouts à voir mais ta photo est superbe! Bise et bonne journée dans la joie! Yes, stories abound in this place, I'm sure! This is a great composition.... it certainly makes the mind wonder! Excellent! Poignant..Hope there are some good memories to recall too and not sad stories lone.. Superb B&W image with the excellent DOF. Textures are beautiful. A fine example of the clothing item left behind. It would have some great stories to tell if it could talk. with beautiful focus, DOF, details, tone & lighting! This lone sandal somehow evokes a story of loss for me, as if it serves as a remembrance of someone now gone. Your processing adds a nice vintage feel here. Beautiful tones and excellent treatment ... Splendid monochrome !!! The young, one legged female giraffe that used to own this sandal is happily employed by Disney, and is now Island "Hopping" in the south seas looking for new film locations . ;>)) .......Class shot Missus !!!. You chose your processing well for this! A beautiful image. In a way it is sort of sad. The treatment and processing is outstanding! Well done Ruthie! What a poignant shot. What a story. This is perfect in black and white. It suggests an old and poignant story. A picture full of poetry! The edition is perfect for the occasion of the precious shoe. The magic is in it! ... Invites you to dream! Best dear friend! HUGS to you!